Since he joined Pafford in 2015, Nick has impressed his colleagues by serving as a leader, staying motivated, and being positive. He has a work ethic that’s second to none, and that shows in his job performance as well as in his overall demeanor and attitude. He inspires people around him to take a little extra initiative at the station and go beyond expectations. Nick is very dependable and often covers open shifts, and he played a significant part in all four Pafford EMS deployments this past year. He is very goal-oriented and takes pride in his work, and he sets the bar for his fellow employees. Anytime he sets out to do anything to better himself or our service, rest assured, it will be done. And Nick doesn’t just complete things: He excels at the things he does. You can see this in his dedication toward his continued education, and by simply observing the way he completes delegated tasks. Nick began his EMS career in 2013—earning Employee of the Year for Westville EMS—before joining Pafford as a PRN NREMT. Nicholas quickly obtained his NREMT-Advance; today he is an Nationally Registered Paramedic as well as a Field Training Officer. 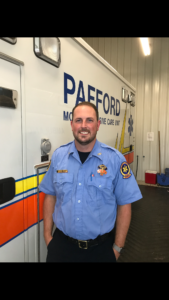 He loves to be able to make a difference in the lives of the patients he treats, and he delivers critical medical attention and advanced life support at emergency scenes, both onsite and in transit. Nick also assists with daily truck and equipment checks, ordering supplies, and scheduling. He is motivated to achieve both personal and organizational objectives, including helping Pafford achieve CAAS accreditation. Nick has participated on a volunteer fire department, responding to fire and first responders’ calls. He and his dog, a Dalmatian, also visited local schools to teach children about fire safety. Today he volunteers in the areas of education and skills check-off.